If we were having coffee, I would tell you that I am counting down the days to Christmas with many other people all over the world. Christmas is my favourite holiday. I love the decorations. And I love the days that my family and I spend enclosed in our home together. Christmas has come to mean quality time which we spend together with no interruptions from the outside world. If we were having coffee, I would tell you that I have begun my shopping for the big day. I have bought most of the gifts, and have started squirrelling away treats for the family as well. I am hoping to get everything bought by the end of this coming week – with the exception of the fresh fruit and vegetables. I do not enjoy the crowds in the shops leading up to Christmas and do my best to avoid malls. In addition, I will be working right up to the weekend before Christmas so getting things done early, means less stress for me. If we were having coffee, I would tell you that Christmas preparations have started in my class as well. Decorating will begin next week, but we have already written letters to Santa. 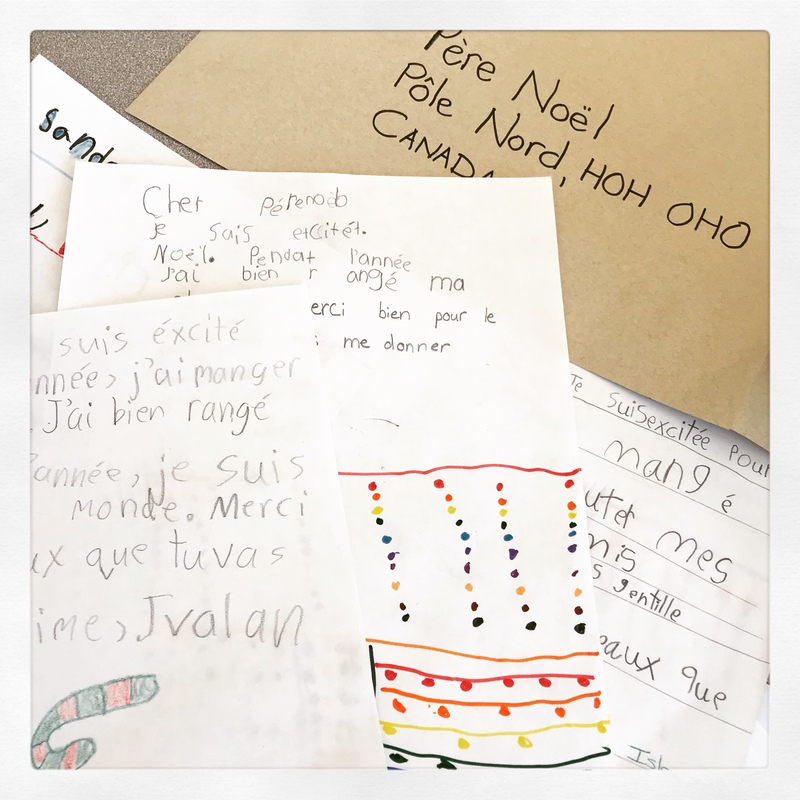 As I work with grade 1s in a French Immersion setting, I created the letter with them in class. The children then chose which sentences they wanted to write. Not all children in my class celebrate the advent of Santa. Those children I asked to write a letter to their parents. The children who celebrate Hanukkah, made reference to this celebration in their letter. If we were having coffee, I would tell you that I am feeling very tired and am looking forward to the winter break. In the meantime, I will continue with the preparations for my favourite holiday of the year. I am in awe of your Christmas preparedness! I have lots more to go but I do love the holiday. We have been doing holiday things in class as well for instance, on Friday, the 1st graders made paper advent chains. They took them home and will tear off one link each day till Christmas Eve. It’s a fun way for them to count down and see how much longer they have to go. The children will also have their annual Holiday concert this coming week. I absolutely love listening to them sing! Enjoy your week. Paper advent chains. What a brilliant idea! Shopping gets stressful the closer to Christmas we get. I like to get it done early when I can and start wrapping. The classroom excitement must be great. We have a school Christmas concert this week for my youngest. Should be fun. Anyway, great coffee post. Thanks for sharing. Hang in there, Colline. It’s not long until the break and your favourite holiday. You seem to be well organised. Enjoy! Thank you Norah. I tend to do things ahead of time to avoid the crowds just before Christmas. I find that I am less stressed that way. It’s a good strategy if you can manage it, Colleen.